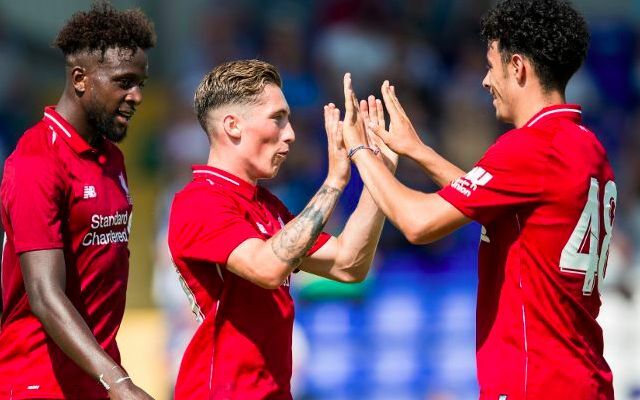 Harry Wilson started his pre-season in emphatic fashion with a brace in Liverpool’s opening friendly against Chester. The Welshman was at hand to breach the hosts’ stern resistance in the first half and pave the way for the Reds to begin their preparations with a 7-0 win. His start marked a deserved reward for a productive loan spell with Hull City over the second half of last season, in which he scored seven times in 14 appearances. It was his left-foot that opened the flood gates in the 36th minute when he expertly lofted the ball over goalkeeper Grant Shenton from close range. An admirable follow-up run saw him in the right position to finish off the rebound on Alberto Moreno’s strike following a stunning through ball from Joe Gomez. Wilson grabbed his second moments before half time with a calm finish into the bottom corner after running onto Curtis Jones’ precisely-weighted through-ball. His second served as the latest reminder of the prolific eye for goal and intelligence that has spearheaded his dominance for Liverpool’s U23s over the past two seasons. It also represented an early claim for a place in Jurgen Klopp’s first team plans moving forward given his need for wider reinforcements capable of drifting centrally and offering movement in behind. Pre-season will stage Wilson’s latest audition before the eyes of his manager, who is currently assessing whether to let the 21-year-old leave on loan again. Steven Gerrard’s Rangers have surfaced as potential suitors, although Klopp will undoubtedly be considering retaining the services of the winger as a means of bolstering his strength in depth next season.